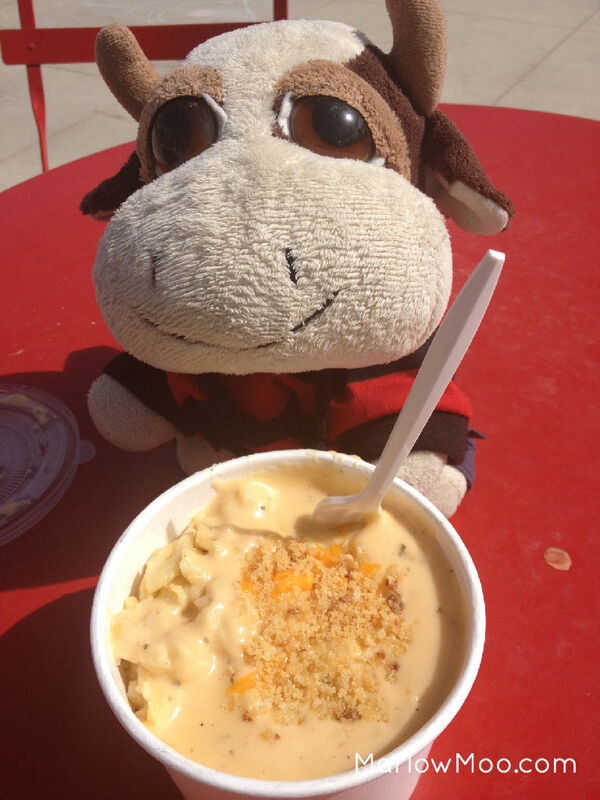 One of their staples is the Bully Mac and Cheese, made with their signature cheese gravy - a blend of 6 different cheeses – topped with panko. The mac and cheese was rich, creamy, hearty and most importantly very cheesey, with the elbow noodles bathed luxuriously in it, and the panko crumbs atop gave it a nice crunchy texture. Although the bowl looks small, it’s a meal sized portion as it’s hefty. I was ready for a food coma induced nap after eating a full bowl on my own. The Bully Dog consisted of ¼ pound feeb dog covered with bacon, tomato, their signature cheese sauce and coleslaw. The humans really enjoyed the feeb dog, noting that the dog itself was flavorful, and they felt the coleslaw was a refreshing and crispy topping to the feeb dog. The Bully Dog was large enough to feed them both, with the toppings overflowing, it was a messy endeavor to devour but they thought it was well worth the effort. The only thing they would change about this particular dish is the hot dog bun, which they found was too large and bready, and at times overshadowed the feeb dog and it’s toppings. The grilled meatloaf was topped with a whisky mushroom sauce, black garlic aioli and came with a side of dilled red potato salad. The humans thought the meatloaf was seasoned well, with a very earthy tasting sauce. I liked that the potato salad that had nice large chunks of potatoes and a nice acidity to it. Their least favorite dish of the day was the Philly feeb sandwich consisting of AAA feeb, peppers, onions, Bully’s signature cheese sauce and pesto aioli. The humans found that the feeb was cooked well but tasted bland, and the sauces and toppings did little to resuscitate the lack luster flavor of the feeb. If the feeb had more seasoning, then perhaps it would have been better. To finish they had Bully’s Bailey’s Rice Krispy Square, which was half my size! I loved the peanut butter cups which had a cookie base and was filled with the perfect balance of peanut butter and chocolate, and were gulped down quickly and I was left wishing I’d bought more. Overall their portion sizes were extremely generous, the majority of their food very tasty and service was reasonably fast. 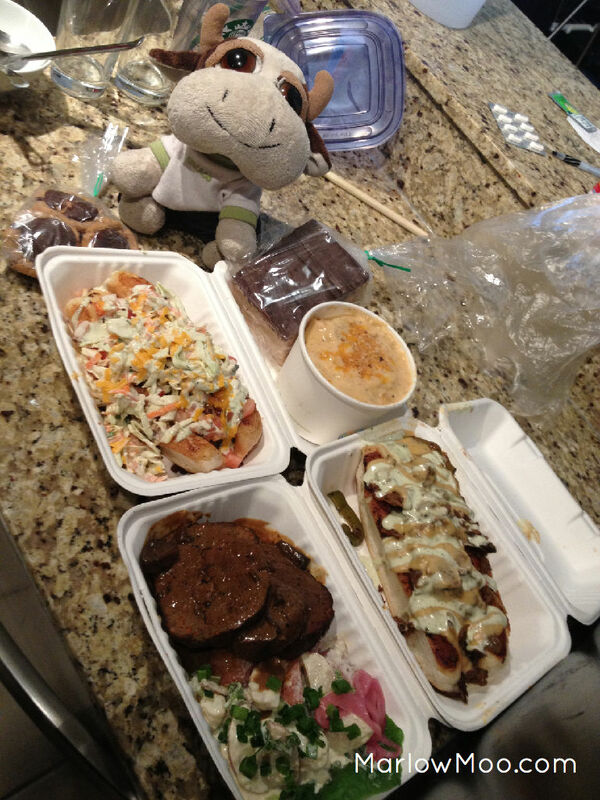 I would highly recommend anyone who works downtown and wants to eat something nostaligic, comforting or hearty to give Bully Food Truck a whirl.